Fears of a U.S. recession are again stalking markets, with the closely-watched and clearly declining spread between the 10-year US Treasury bond yield and the 2-year yield—i.e., the “10 minus 2”—nearing inversion, a historically reliable harbinger of economic downturns. In this setting, each (and frankly any) bit of economic and/or financial data is scrutinized for potential confirmation or rejection of the recession hypothesis, with political factors incorporated into these assessments through ad-hoc speculation about specific issues (U.S.-China trade negotiations, closing/walling the Mexican border, the latest presidential investigation, etc.). To the extent political data is considered, it is generally on the output side: how will economic conditions impact a politicians’ popularity, her chances of election/re-election, and the like. GeoQuant’s AI-driven political risk intelligence platform helps add politics to the equation in a far more systematic, objective and actionable way. Through a human-supervised machine learning process, we measure political risk across a wide range of fundamental political factors at high-frequency, and then aggregate these factors into commercially-relevant political risk indicators. By quantifying political risk in this manner, we can directly and systematically analyze the relationship between U.S. politics and the risk of a recession. Here we do so by looking at our topline U.S. Political Risk indicator against a daily measure of the “10-minus-2” yield spread (aka the “yield curve”) since 1 Jan 2013. From that date onwards, there is a strikingly strong, negative correlation (r= -0.72) between U.S. Political Risk and the yield curve, with higher risk associated with a smaller and smaller spread, approaching inversion. 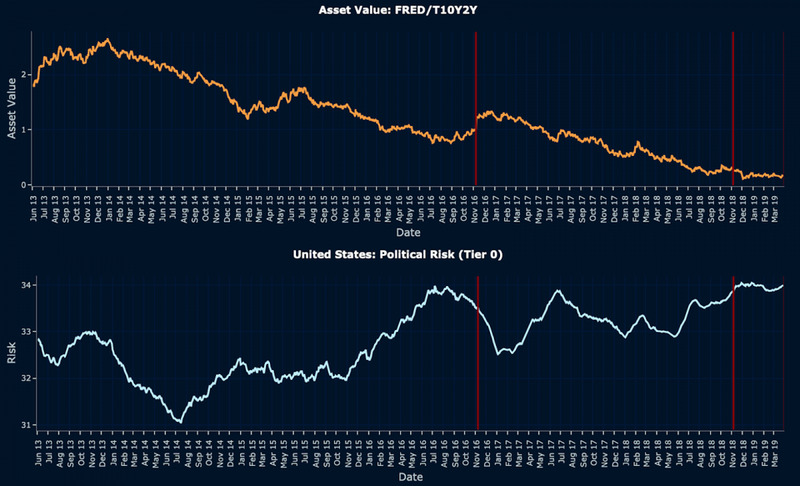 While this relationship has remained quite consistent over the past 6+ years, it has recently strengthened considerably, specifically since the bond market (again) began sending warning signals in 2018, increasing to r = -0.84. 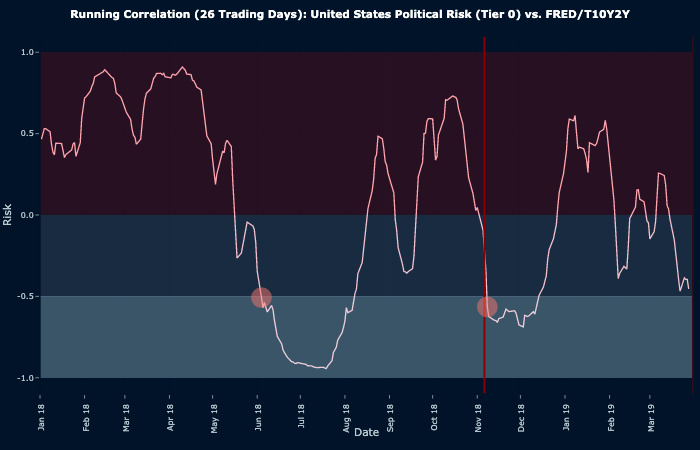 And per the 26 trading-day rolling correlation summarized below, it appears we are heading back into another highly negative (>-0.50) phase of the relationship, territory last reached in June and December 2018–which market participants will remember well. At a minimum these trends suggest that elevated U.S. political risk will weigh on the economy as it moves toward a potential recession, a view we have held since before the 2018 midterm elections. Per our deeper analysis on the app, higher geopolitical and institutional risks are clear culprits, with a long list of current and future risk drivers for both. Abroad, the U.S. faces a grinding tech cold war with China, heightened tensions on the southern border, saber rattling over Venezuela, and uncertainties around North Korea, to list a few concerns. Meanwhile, at home, the country is entering another highly polarized election cycle with a number of live institutional battles pending between the executive branch and Congress at home. In short, there are plenty of reasons to worry—at least politically speaking. As anticipated, President Erdogan’s ruling AKP party got a black eye in yesterday’s municipal elections—losing control of both the capital Ankara and largest city Istanbul amid an economic downturn—while exploiting their substantial incumbency advantages to remain firmly entrenched atop Turkish politics nationwide. Going forward, we continue to expect that the Erdogan/AKP government will keep pushing lira-negative economic policies and anti-Western rhetoric while it licks it wounds. Also as anticipated, on March 17th upstart candidate and actor/comedian Volodymr Zelenskiy handily won the first round of presidential voting on Sunday with 30.5% of the vote and will face incumbent President Petro Porosheko, who won only 16.2% of the vote, in the 21 April second round. This result had been signaled by volatile and rising Government Instability and by popular discontent over rising risks across quality of life issues illustrated by GeoQuant’s Human Development Risk indicator. Zelenskiy has publicly ruled out cooperating with the 37 other opposition presidential candidates, but first round numbers put him in a strong position to win the presidency given the incumbents demonstrated weakness. To prevail in the second round Zelenskiy needs to demonstrate that he can develop a strong team capable of addressing corruption and the economy to capitalize on the public’s enthusiasm for a significant transformation in political leadership.